Twice this year I have decided that I’m going to have an awesome weekend and both times I have. My birthday was fantastic and this Easter weekend was pretty darn good, too. So I’m trying to decide if I decided they were going to be awesome and they were because of my positive attitude or if they would have been awesome regardless. Currently I’m sticking with the first option as I like to think I have control over it (but, hey, does that mean I also have control over the super majorly crappy days too? hmmmm…). I started the weekend with an 8 mile run through Rock Creek Park followed by Restorative Yoga at Yoga Heights. It had been a few weeks since I’d done yoga so that was a much appreciated class. 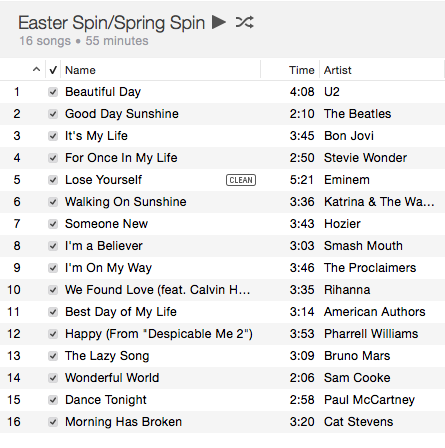 I also spent a lot of Saturday perfecting my playlist for the week and I must say, it’s pretty darn good. It’s not quite the Detroit mix, but it’s pretty darn close. Easter is my favorite holiday! It’s all about hope and newness and optimism. Last Easter was a great brunch put on by Katya so I was skeptical this Easter could measure up, but it was pretty close. I started with a tough 5 mile run followed by my regular Sunday morning spin class. Why I chose a route that included a one mile hill is beyond me, but I did. The cycling class was super hard after that — I’ve run after spinning several times but not before. But the class was great — we all had so much energy and the playlist was really fun and kept us moving through a tough class. After that, I rushed home and frantically changed and was in a pew at church less than 45 minutes after getting off my bike! A group of us then headed out to City Tap House for brunch. The food was decent, though nothing to write home about (perhaps just to blog about?). They were quite generous with the mimosas, though. A friend pointed out that cheap sparkling wine is probably less expensive than orange juice so it makes sense they’d have such heavy pours. They did have chocolate fondue, which I promptly got on my beautiful dress. Luckily some dedication and ice got that out. …now I’m off to spin a bit more. Have a great rest of the week!